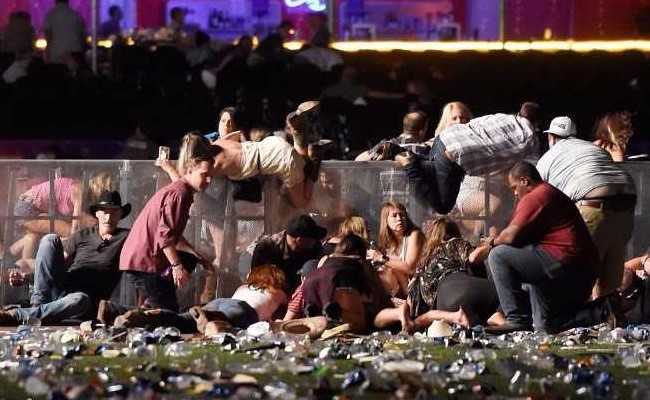 When the shooting began, some refused to believe a massacre was underway. "It's not real gunshots," one man yelled as panicked concertgoers around him ducked for cover. "It's the fireworks, fireworks! Guys, stop, stop." "We got shots fired!" 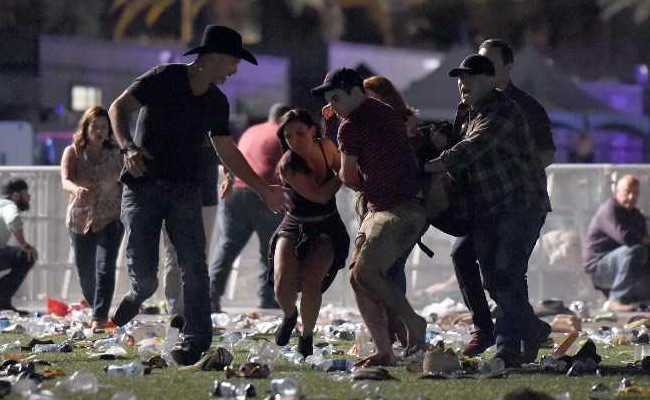 a Las Vegas police officer radioed in at 10:08 p.m. "It sounded like an automatic firearm." "I'm pretty sure a terrorist attack just happened next to me. I'm at Mandalay Bay," Las Vegas Twitter user @GLOKMIN tweeted early on in the assault. "Drivers avoid LV Blvd and Tropicana. Active shooting from Mandalay Bay. Possible 3 shooters," the alert said at 10:25 p.m.
Minutes later, police ordered people to take cover inside the Mandalay Bay. "Even cabbies must exit their vehicles and go into hotel," LV Cabbie Chronicles tweeted at 10:28 p.m.
"We have a head shot. We have a head shot," one man yelled in a video of volunteer medics at work. "Go ahead, put them all in the back," she said in one video. "One died in the back of the truck and my fiance had to carry him inside the hospital," Lee said on Instagram. "This was a nightmare. I've never ran for my life like I did tonight." Rachel Crosby, a reporter for the Review-Journal, saw events unfold from University Medical Center, the only Level 1 trauma centre in Nevada, where all the trauma beds were full. "I have seen a handful of nurses jogging into front and back hospital entrances," Crosby tweeted. "I have seen a handful of citizens speed-walking away from trauma centre. Colour drained from faces." "Jesus," one nurse repeated over an over. Another nurse phoned a loved one, got on the ground, head down, and took deep breaths. "More and more staff wearing scrubs keep filing in UMC entrances," Crosby said. "Confirming that one suspect is down," Las Vegas police tweeted at 11:58 p.m. "This is an active investigation. Again, please do not head down to the Strip at this time."